Pleats for my tweets, Heils come in handy! Your old scribe already has the motorcycles, LP collection and beautiful woman of his youthful dreams, so has to look wider to complete any outstanding gaps in the "I wouldn't mind one of those" lists of his youth. Hence the recent ebay purchase of a pair of the Heil Air Motion Transformers, manufactured under exclusive licence by ESS. In the olden days when one could tick boxes adjacent to the names in the advertisers index of HiFi News & Record Review and send it to Link House by Freepost, the deluge of material from ESS inspired youthful scribe enthusiasm to want one of those - well, a pair actually. They duly arrived, well packed, from Canada, once I had paid a stupid amount of duty well in excess of 20%VAT that was demanded by that doyen of rip-off Britain, HM Customs and Excise. Dr. Oskar Heil contributed to the invention of the Magnetron tube back in the ole days of radar and to pioneering work with Field Effect Transistors (FET's) that many audiophiles believe sound more like valves than bipolar silicon. Then, like so many of that time, turned his attention to audio. He developed the Air Motion Transformer (AMT) tweeter, so called because the folded diaphragm has the effect of multiplying the surface area 5:1, much like the windings of a 5:1 transformer or a 5:1 horn. This tweeter (technically a "Squawker" in long forgotten nomenclature, as it extends down into the midband) enjoyed marketplace vogue in the 70s when installed in the ESS range of loudspeakers, partnered with 250mm and 300mm drive units. The Heil AMT uses a folded pleated Mylar diaphragm of a mere 0.0005" thickness (made where the 21st century SI units have yet to make an impact). The signal passes through a conductive aluminium layer, just like a ribbon tweeter, but deposited on the pleated Mylar like the loops of the serpent (the old musical instrument with the cornet style mouthpiece). Hence with each change of direction the force will alternate between attraction and repulsion "which neatly pump air" (Lou Reed, 1967, Lady Godiva's Operation). Excellent animations of the Heil AMT at work can be seen here. Hence, unlike a normal piston loudspeaker that excites the air by alternately pushing and pulling a cone or dome, the Heil AMT squeezes and expands its diaphragm's pleats like an accordion. Because of the surface area ratio it potentially moves the airload at a very high velocity, 5 times higher than the diaphragm movement itself. The moving mass of the Mylar Diaphragm is already very low (compared with cones and domes) and the magnetic structure very powerful, this combination results in extremely high air volume acceleration. In 1974 Dr Heil's AMT speaker principle was granted a US patent US#3,832,499, issued on August 2. The current version, now back in production by ESS, look remarkably similar to the drawings in that document, demonstrating the rightness of the idea straight from the starting blocks. Depending where you look, current model specs include resistive 3.4Ω load combined with 99dB/W (4Ω) sensitivity but therefore current hungry, while the ones under test are 5Ω and nearer 94dB sensitivity at 2.8V. Lowest price on the current model seems to be Parts Express at $350 each plus shipping and local taxes; Parts Express also have spare diaphragms at $80, and Simply Speakers have diaphragms at $87.50, which is worth knowing! The model available at Parts Express claims 92dB sensitivity, 2.9Ω, with 40W RMS power handling with crossover at 12dB/8ve at 800Hz. The current model is just over 150mm square and 110mm deep, so is the old one, but the older model seems to have a different plastic surround. Identical anti-tamper warning labels adorn old and new alike. Don't microwave your dog to dry it either. The blurb quotes "an unusually high combination of efficiency and bandwidth to be attained in a single loudspeaker", which is both bad English and a crock to boot. Many moving coil drivers manage a couple of decades (eg 35-3,500) and the single driver brigade love drivers that extend from 100Hz to above 10kHz and achieve real sensitivity of over 98dB at above 8Ω, so 800-20,000 is reasonable at a realistic voltage sensitivity (efficiency should always be expressed as percentage not dB/V). Further ludicrous claims that "The AMT is a dipolar transducer, making it act just like a live musical instrument" actually undermine what transpires to be a truly great audio product. The mix of ultralight large radiating area, folded into a small apparent source does make for an exceptional frequency response, transient response, phase response and dispersion characteristic. The vertical diaphragm folds result in a frontal (and rear) area that delivers wide dispersion in the horizontal axis but tightly controlled vertical coverage. This contributes to a good horizontal match to the LF driver while minimizing undesirable early reflections from floor and ceiling. A variation of the AMT is marketed by Mark & Daniel, but ESS continues to manufacture the original Air Motion Transformer tweeter, as designed by Dr. Oskar Heil over 30 years ago, remarkably unchanged from the example I recently bought on ebay, despite the anomalies in the various specs found online. I initially used music to set them up by ear using an active crossover straight after listening to the B&C Drivers DT 400N, which being 96dB/W directional horns, demands a big adjustment to the active crossover. Some time later, without further adjustment, I got the signal generator out to discover that I had set the treble 2-3dB lower than flat with the midband immediately below the crossover point. The bass-mid driver is hot by a similar amount in this region and I generally find that setting by ear results in a shelf up from the bass-mid response rise, through the crossover point and up through the treble. That the ESS AMT did not invite this usual error raises a number of psychoacoustic questions. The bass-mid units are pretty flat (within a 4dB envelope, that is, plus or minus 2dB) from below 100Hz to about 1kHz and by ear I had set the ESS AMT tweeters to this level rather than the rather forward presence region that the B&C drivers were matched to by ear. The B&C tweeters are very directional (radiating into an almost textbook 90° cone) and thus contribute little off axis energy to the in room average response. The dipole ESS AMT drivers radiate equally front and rear with a vertical circular null above, below and each side. The response is similar to a figure of eight microphone. The out of phase rear radiation is not out of phase once it has been reflected into the room, the short wavelengths at high frequencies mean that the multiple reflections (and ensuing cancellation and reinforcement) soon average to at least 6dB loss even if the surfaces are very reflective to high frequencies, which domestic rooms are not. Raising the treble level by 1, 2 and 3dB was far less audible than would be with highly directional treble drivers. This extraordinary effect was symptomatic of the ESS AMT tweeters' ability not to make their presence felt. Most dome treble units (especially soft domes) construct their extended frequency response by controlling a series of resonant modes by various feats of damping of the dome material, phase plugs, magnetic shorting rings, eddy currents etc with varying degrees of success. Ribbons avoid this, but tend to add their own problems of distortion dominated by even harmonics (hence the tinkly quality and resemblance to many euphonic moving coil cartridges). Electrostatics are often blighted in the treble by their large surface area (hence Quad's use of a narrow centre treble panel on the ESL57 and concentric rings on the ESL63). Oskar Heil's pleated design, being push-pull in nature, will tend to cancel the low order dominant even harmonics (which may be a mixed blessing) and the pleats increase the radiating area while keeping the frontal area small. The only problem that may be unique to this design might be if the adjacent pleats behaved like a diffraction grating, causing irregularities in the frequency response. Crossed over very high (6kHz) at first, to get the measure solely of the 35kHz extension, without having to worry about power handling, the ESS AMT tweeters are among the best. These drivers do not shock with the exaggerated transients of some (the old double magnet Focal fibreglass inverted dome springs to mind) and provide the most accurate ride cymbal noise it is possible to extract from vinyl (it not being possible to extract accurate ride cymbal noise from red book CD) and proved a match made in heaven for the Dynavector Te Kaitora Rua, providing such immaculate timing for percussion that anything Latin American deserves a spin. Resonances cause phase irregularities as well as amplitude (on the impedance graph of a driver, remember that upslopes equal inductors and downslopes equal capacitors - however brief) and the lack of any discernible resonances from the ESS AMT tweeter also contributes to great timing. The effect of this is a really stable soundstage. The figure of eight dispersion pattern produces a similar included angle as a 90° horn but with the early reflection contribution of the rear output. These early reflections do impair the possibility of the soundstage height delusion; it must be a delusion as it is constructed by phase anomalies tricking the human ear (our dogs have never been fooled), as demonstrated by the LEDR test, except where a Soundfield microphone has been used. The ESS AMT tweeter hangs the soundstage within a relatively flat, but deep, elipse extending slightly beyond the speakers. The dispersion pattern will tend to dictate the crossover point from a bass-mid or midrange driver. As soon as the crossover point was lowered to where the cone driver was radiating much wider than 90°, disintegration occurs. The term dis-integration is chosen as the sound then distinctly comes from 2 separate sources, it has ceased to be integrated. This is the realm of system design, not of the tweeter itself. 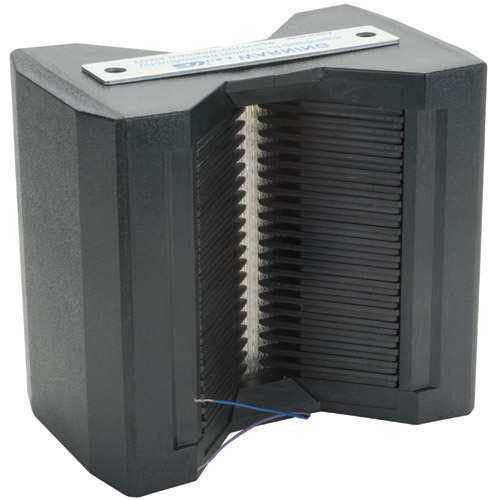 It is therefore understandable why successful commercial applications of the Heil Air Motion Transformer tweeter have used big bass-mid drivers to cross over low enough to reap maximum benefit from this expensive driver. The other vital aspect of system design is matching the speed of the bass-mid driver to the ESS AMT tweeter. Ultra low mass cones combined with BIG magnets and short voice coils are the order of the day. The ESS Air Motion Transformers are among the finest treble transducers I have tried. They are ruthlessly revealing of surface noise from vinyl, without the exaggeration of resonant coincidence, but really revealing nonetheless. Because they are so transparent, the character of the particular noise of an individual pressing can become distracting, but faced with relatively clean vinyl this is not an issue. Equally, they reveal the limits of red book CD compared with wider bandwidth formats, even though none of us will ever hear their 35kHz upper limit. High speed analogue tape recordings of dog whistles have not been on my playlist for a long time. The ESS Heil Air Motion Transformer is in a wholly different league from the soft domes that plague most commercial loudspeakers. If the best soft domes are a performance worthy of a great amateur Sunday League side, the ESS AMT is in the European Champions League. This does not means it is absolutely the best treble transducer ever made, at this level, because such a thing does not exist. The ESS Heil Air Motion Transformer is in the top drawer with the horn loaded Decca London Ribbon, the direct radiating Apogee ribbons the Quad ESL57 treble panel, the Focal TDS, lightweight compression drivers and horns like the B&C DE-400TN-8 and the classic Lansing brothers' (James B and Altec). Indeed, the AMT achieves a clarity of transient response unequal elsewhere.